A quitclaim deed is a legal instrument which is used to transfer interest in real property. The person who owns the property, the grantor, terminates (“quits”) any right and claim to the property, thereby allowing the right or claim to transfer to the recipient/grantee. 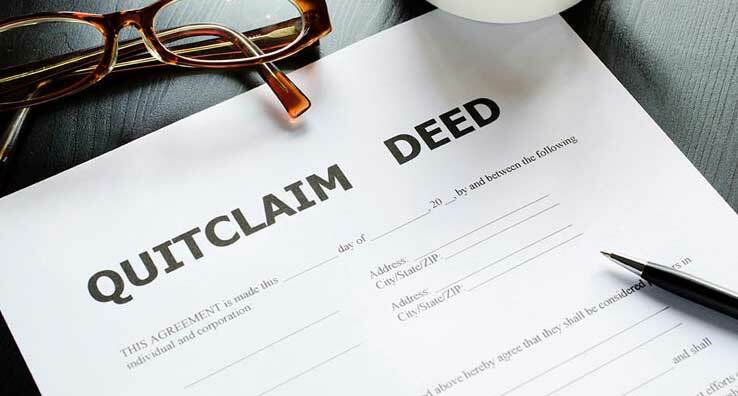 Unlike most other property deeds, a quitclaim deed contains no title covenant and thus offers the grantee no warranty as to the status of the property title; the grantee is entitled only to whatever interest the grantor actually possesses at the time the transfer occurs. This means that the grantor does not guarantee that he or she actually owns any interest in the property at the time of the transfer, or if he or she does own an interest, that the title is free and clear. In contrast, Warranty Deeds contain warranties from the grantor to the grantee that the title is clear or that the grantor has not placed any encumbrance against the title. Because of this lack of warranty, quitclaim deeds are most often used to transfer property between family members, as gifts, or in other special or unique circumstances. An example use for a quitclaim deed is in divorce, when a husband acquires the marital home in a divorce settlement, the wife could execute a quitclaim deed eliminating her interest in the property and transferring full claim to the husband quickly and inexpensively.